As a matter of fact, we should be exceedingly regular with the application of a good after-shower body lotion to help our skin make up for the lacking moisture in the air, especially during the punitive winter months. But let’s face it, how many of you actually go for that extra step and slather on lotion that barely seems to get absorbed into the skin. Not many, I am sure! Well, today we are here to introduce a revolutionary product that cuts back on your routine and allows you to moisturize while still in the shower. 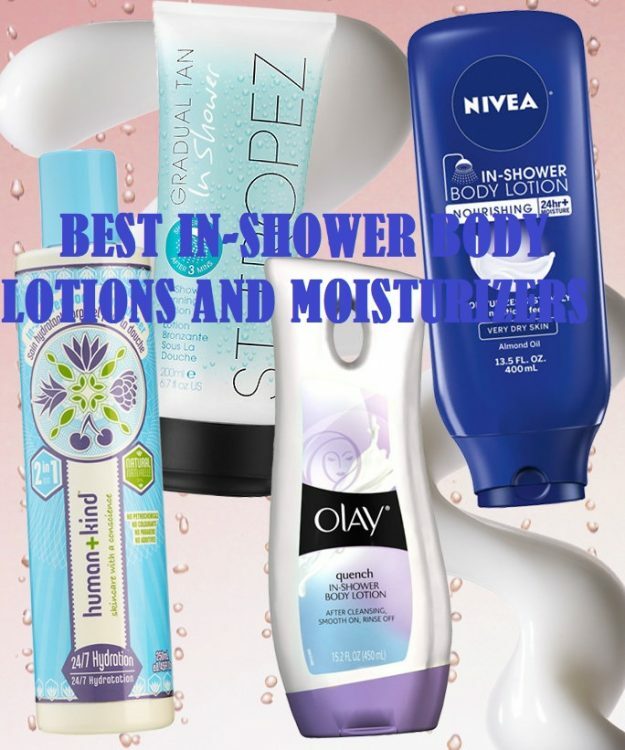 The super-amazing and immensely productive in-shower body lotions and moisturizers are the perfect remedies that impart the much-needed moisturization with the least possible effort. How Does an In-Shower Moisturizer Work? Generally, most people are not quite familiar with the use of an in-shower body lotion or moisturizer. Some of them may even ignore it altogether thinking it is going to be just another worthless addition to your shower experience. However, in-shower moisturizers are different. Not only do they impart long-lasting skin hydration, but also substantially shorten your skin grooming routine. In-shower moisturizer comprises of a unique mixture of ingredients that get easily stimulated by water and deposit a layer of emollients and oil on the skin which gets quickly absorbed before the lotion is rinsed off. If you are experiencing ultra-dry/flaky skin, then you should definitely give Olay Ultra Moisture In-Shower Body Lotion a try. Enriched with the goodness of shea butter and essential oils, this in-shower body lotion improves the overall hydration of the dry and irritated skin. Enjoy 60% smoother and softer skin after the use of this highly effective rinse-off lotion. Claiming to secure results in just 5 days, this rich in-shower lotion deeply imbues the skin with moisture. It works with the balminess of your shower, revealing softer, indulgent and restored skin. The primary ingredient of this heavenly product is the extremely nourishing shea butter. Apart from moisturizing, shea butter plays a vital role as a healing constituent that treats a plethora of skin problems such as wrinkles, blemishes, itching, allergies, sunburns, frost bites and other related skin conditions. Going as per the reviews of the users, this product is certainly a huge HIT! Combining the goodness of highly moisturizing ingredients, this product abolishes the concerns faced by people with an excessively dry skin. It lasts for an entire day, offering a convenient way of losing the nauseating dry winter skin. 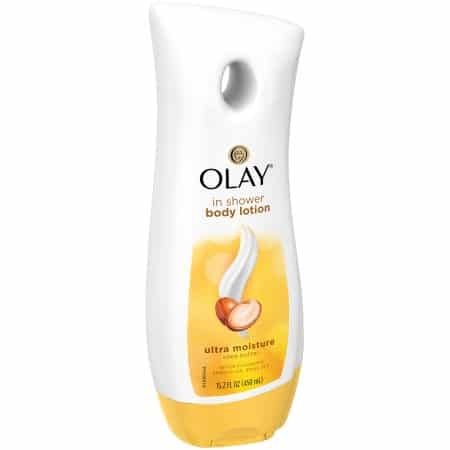 Another thing users absolutely love about Olay Ultra Moisture In-Shower Body Lotion is its fragrance. It smells heavenly. It is super quick to apply, the excess gets rinsed off and you come out of the shower with a moisturized, soft and great smelling skin. On the negative side, the product has recently been launched with a new formula and a slight change in ingredients which has been disliked by many. This shift in the formula has left the product with a strange, chemical-like lingering scent, generating a string of unhappy users. For those battling with the problems of an immensely dry skin, this product is certainly a must-try. Even though one out of every ten users has complained about its lingering scent, the product remains to be one of the highly recommended in-shower body lotions. A huge number of users have given thumbs-up to this amazing nourishing product. Developed with the goodness of heavily nourishing ingredients, Nivea In-Shower Body Lotion will certainly make a good choice if you are looking for long-lasting hydration. Dermatologically tested, this product is a non-sticky formula that even calms eczema-affected skin. Suited for sensitive, hypoallergenic and baby skin, this super smooth formula comes with advanced antioxidant properties. This in-shower lotion contains coco-glycerides that act as conditioning agents that prevent the skin from losing any moisture, keeping it silky-smooth and soft. The product contains Cocoa Butter which is an amazing moisturizer. It keeps your skin from peeling by hydrating it from deep within. It also comprises a fair share of antioxidants that augment collagen production and improves skin elasticity, keeping wrinkles at bay. Apart from that, a heavy concentration of glycerin, a potent humectant, helps to draw water from the air and into the skin, imparting lasting hydration. Nivea In-Shower Body Lotion mostly bags enthusiastic reviews from all its users. A lot of people suffering from extremely dry skin are apparently quite satisfied with this product. It imparts intense hydration and is quite easy to rinse off. However, it comes with a gentle feminine fragrance and thus, may not be too popular among male users. 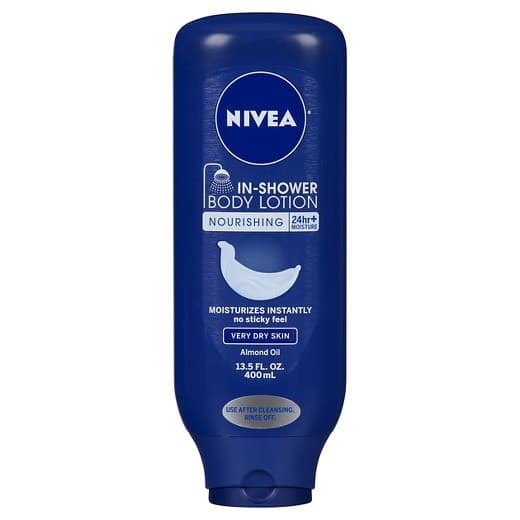 Overall, Nivea In-Shower Body Lotion is a great product that offers full value for money. It soothes and nourishes over-dry skin with the least effort. It is quick, easy to apply and rinse off, deeply hydrating and unquestionably a must-buy product, although, you might need to rinse your shower floor at the end to evade tripping. A refreshingly scented moisturizer, this product by Jergens is celebrated for its miraculous moisturizing abilities. It quickly gets absorbed into the skin, creating a barrier by locking-in moisture and revealing soft and smooth to touch skin. 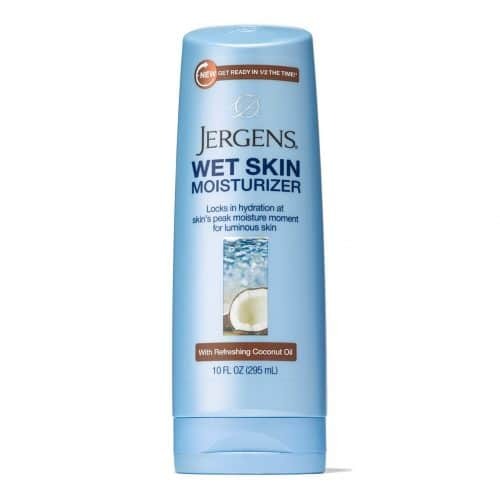 Jergens Wet Skin Coconut Oil Moisturizer doesn’t need to be rinsed off in the shower. For those of you hard pressed for time, this is a huge plus. It simply can be applied to the freshly-showered skin prior to towel drying. Even though it contains a rich amount of Coconut oil, it is absolutely non-greasy. Coconut oil is indubitably the star ingredient in this product. Known for its multifarious benefits, coconut oil deeply moisturizes the skin. Lauric acid is another incredible ingredient that imparts antibacterial and antifungal properties to this moisturizer. An extravagant concentration of glycerin and Vitamin E helps to lock-in the skin moisture and keeps it soft and protected from the hurtful effects of aging. With a lot of pleasant reviews from its users, this product, even though being a lotion, is exceedingly quick to apply. It barely takes a minute before all the product gets soaked into the skin, leaving behind zero residues. Additionally, the splendid coconut scent makes it even better. It nurtures the skin nicely and actually makes it glow. Imbued with numerous skin-friendly ingredients, Jergens Wet Skin Coconut Oil Moisturizer is a perfect addition to improve your bathing experience. It makes a good choice for people who are looking for something refreshing and mild for their delicate skin. It yields remarkable results in the form of cleaner, nourished and hydrated skin. Eucerin’s In-Shower Moisturizing Body Lotion is a powerful formula that is known for its skin-healing ingredients. Imparting intense skin moisturization, this body lotion leaves absolutely no residue and helps to fight acute skin conditions such as irritation, itching, and aging. The potent formula boasts of hydrodisperion technology that implies the product continues to nurture the skin even after it has been rinsed off. It promises to offer an extra dose of hydration that eliminates the need of applying any sort of greasy lotions even during the unforgiving winter months. It works well for people suffering from eczema as it is free from all fragrances. This dermatologically tested product is infused with Pro-Vitamin B5 that gives your skin a heavy moisture dose and treats wounds, skin irritation, inflammation, and itching. Besides, Panthenol nourishes the skin and improves its texture by making it softer and smoother. Hydrogenated Coco-Glycerides prevent moisture loss by forming a protective shield on the skin’s surface. A rich concentration of glycerin helps to attract moisture from the air and imbibe into the skin, making it moist, soft and supple. This product from Eucerin is one of the most effective in-shower body lotions, according to the users. A lot of them have told about witnessing visible results from the very first wash itself. It simply dissolves into the skin and when you rinse it, there is no nasty gluiness, just refreshingly smooth and hydrated skin. On the negative side, some users have complained about the slippery feeling that is hard to remove off the floor. Eucerin’s In-Shower Moisturizing Body Lotion is a good product that offers long-lasting hydration to all skin types. However, the product is slightly expensive in comparison to the above-mentioned products that offer similar benefits at a much lower price. But if you want to indulge in experimenting with a reputed skin brand, this product is definitely worth it. Our last product on the list is not exactly an in-shower body lotion or moisturizer but is highly known for its amazing abilities to intensely moisturize wet skin. Neutrogena Body Oil is a unique light sesame formula that disappears into the skin, revealing silky soft and buttery skin. This body oil by Neutrogena claims to make to your skin fresh, rejuvenated, moisturized and glowing. This versatile product can be used as an in-shower lotion or can be added to your bathwater to relax and unstiffen your skin. It prevents all kinds of bacterial infections, heals damaged cells, reduces and slows down the signs of aging and intensely moisturizes skin. The star ingredient of this body oil is Sesame Seed oil. Widely used as a flavor essence in South Asian, Chinese and Japanese cuisine, this seed oil exhibits the power of moisturizing your skin from within. It gets easily absorbed into the skin and promotes softness and agility. It is rich in essential fatty acids such as linoleic acid that acts as an effective moisturizer and Vitamin B, E & D that treats scars and rashes. It also contains Isopropyl Myristate that imparts a rich creamy feel to the oil. 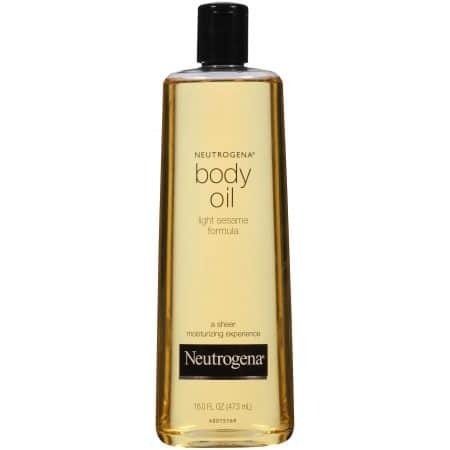 According to the users, Neutrogena Body oil is an extremely effective formula that applies quickly, wicking the moist feeling away from your skin for a silky soft touch. It thoroughly moisturizes and helps to lighten dark scars and spots over time. It is available in a fragrance-free formula as well; however, the light sesame scent is quite popular among the users. On the flipside, a lot of users complained about its packaging. The bottle design is such that you can accidently pour out a large quantity, thus leading to product wastage. Had this product come in a pump dispenser, it would definitely make a great choice. Nevertheless, if you are looking to infuse heavy moisture into your skin and treat infections and scars, you should certainly try this out. According to a research, the best absorption timeframe when your body absorbs maximum product is two minutes post the shower. Even if you opt for a highly effective post-shower moisturizer, chances are that you will be past those ideal two minutes in the time to take to get out of the shower and dry yourself. In-shower moisturizers, therefore offer the most convenient way of moisturizing your skin while you are still in the shower. Applying the moisturizer to wet skin allows it to lock in more moisture to keep you hydrated all day long. Here are three more reasons that will persuade you to make a switch from your regular lotion to these super-amazing in-shower moisturizers. In-shower moisturizers skip the moisturization part as they instantly hydrate and nourish your skin, eradicating the need to dry yourself off. Most of these products offer long-lasting hydration that keeps your skin soft and nourished for hours. They get activated with water and provide intense moisturization even after your body gets dry. In case of a regular moisturizer, you need to towel dry before you can apply it. With in-shower moisturizers, you can reach the difficult areas with ease. How to Use an In-Shower Moisturizer? 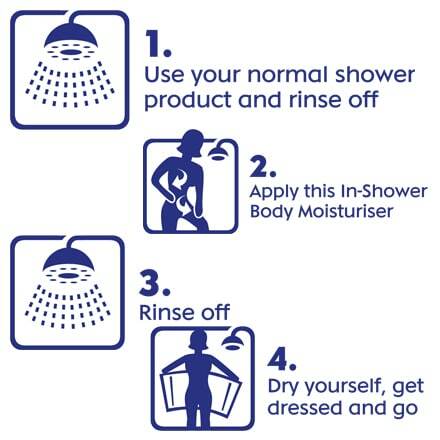 Follow the below-mentioned steps for easy application of your favorite in-shower moisturizer. After you lather up with your body wash, just rinse off the froth. Apply a generous amount of the in-shower moisturizer to your entire body. Do not apply it on the soles of your feet as most of these products are extremely slippery. Avoid spilling it on the shower floor to save you from skidding. Rinse off and towel dry and you’re done. Enjoy highly moisturized skin for the rest of your day. Well, if you still haven’t included in-shower moisturizers in your skincare and grooming regime, you are missing out on a heavy dosage of nourishment. Apart from saving your valuable time, they are much better than their post-shower counterparts in every way. Today, we have chosen Olay Ultra Moisture In-Shower Body Lotion as our top product. This shea butter infused product claims to improve skin texture by 60% in just 5 days. Loaded with skin-friendly ingredients, it improves collagen production and keeps your skin soft and nurtured. Also, it is extremely affordable. So, go and buy your share of skin nourishment today.